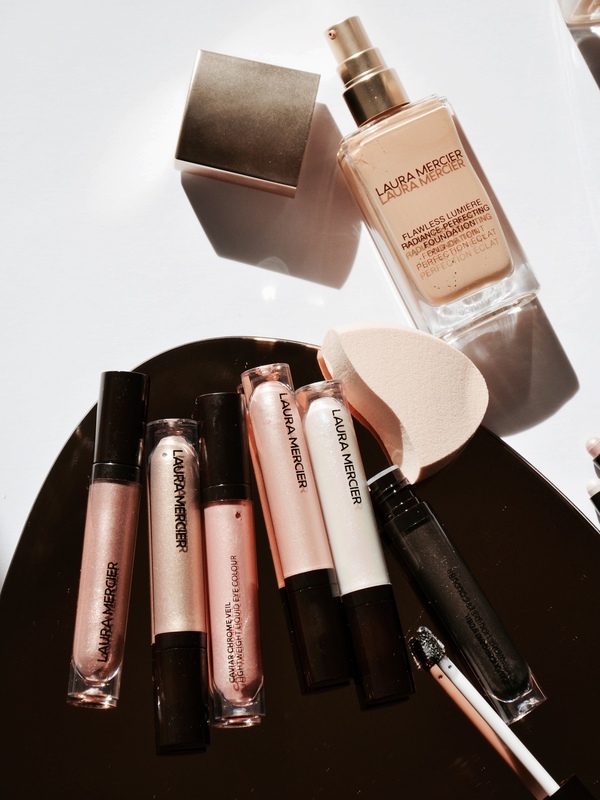 Laura Mercier has been on fire with new releases! The brand released a new Caviar Chrome Eye Collection and also added a new base to their line, the Lumiere Radiance Perfecting Foundation. I’ve been testing both releases for awhile now so I wanted to share my thoughts on both. If you’ve been reading my blog for awhile, you would know my love for cream eyeshadows. 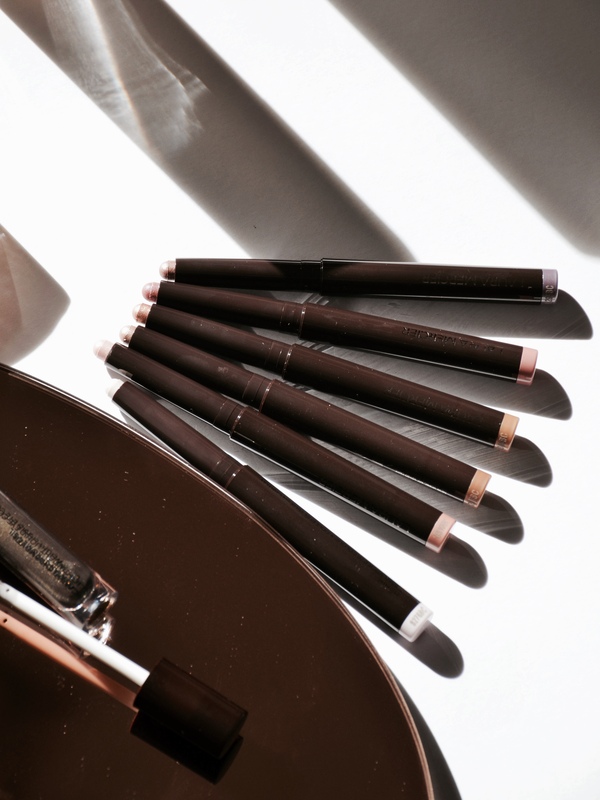 I love and use the Laura Mercier Caviar Eye Sticks almost on daily basis so I was excited to see a metallic formula of some of my favorite shades. Laura Mercier also released Caviar Chrome Veil which is a totally new liquid eyeshadow formula. Both products are supposed to be subtle but also buildable for a more intense metallic look. One swipe, provides a beautiful sheen on the eyes and an almost glossy look that is crease proof. The Caviar Chrome Veil Liquid Eyeshadows have a sheer but buildable coverage. They are in liquid form and come with a doe foot applicator which is nice for directly applying the product on the eyes. They have a cooling effect upon application and they dry fast so I recommend applying and working on one eye at a time. With one layer, I get a beautiful sheer shimmery sheen on the eyes which I love to wear on natural makeup days. These are a great alternative to an eye gloss as they are easier to work with and last and don’t crease on the eyes but give a similar effect. The Caviar Chrome Veil Liquid Eyeshadows are buildable so after you blend the first layer, you can apply a second if you prefer more pigment. These lasted me all day with no creasing. You can use the Veil Liquid Eyeshadows on their own or over other eyeshadows. They work well over powder eyeshadows but also over the Caviar Eye Sticks. The Caviar Eye Sticks have one of my favorite cream eyeshadow formula that comes in stick form and the new shades are no exception. They all wear really well and apply and blend so easy on the eyes. The chrome formula has a more intense metallic finish than their other pearl formula, which has more of a shimmer satin finish. The shade in Amethyst is one of my favorite shades to wear for every day and I also love the Intense version for when I want more impact on the eyes. The shade in Rust is also an interesting shade. Because it’s duo-chrome, as you blend it, it looks like you have a couple of shades on the eyes which makes it for a great one eyeshadow look shade. 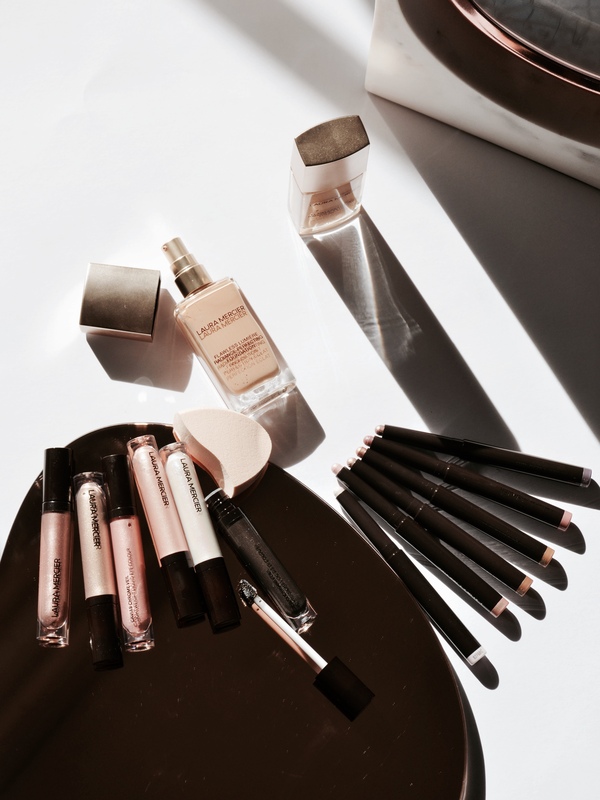 The Laura Mercier Flawless Lumere Radiance Perfecting Foundation is a luminous liquid foundation which claims to hydrate the skin for up to 15 hours and provide you with a medium to full but weightless coverage. Judging by the name, I though this would be a very glowy foundation that will only work for dry skin. But to my surprise, the Flawless Lumere Radiance Foundation has more of a natural satin finish. It is not matte but it is also not super glowy, so I think it will work for most skin types. – Super Crystal Clear Pearl: Features a super-fine texture with a flawless, flat surface for a light-reflecting effect, without a chalky look. – Silver Ear Mushroom Extract: Diminishes the appearance of fine lines and wrinkles. – Vitamin C: Helps reveal brighter, clearer, more even toned skin over time so that even without makeup, skin is radiant. I received two shades in 1N1 Creme, listed for fair skin tones with neutral undertones and 2W1 Macadamia, good for light skin tones with warm undertones. I tested 2W1 Macadamia which is a tad too light for my light/medium skin tone so I definitely need to grab a darker shade. I think 3N1 Buff would work for my current tan and will be my perfect summer shade. 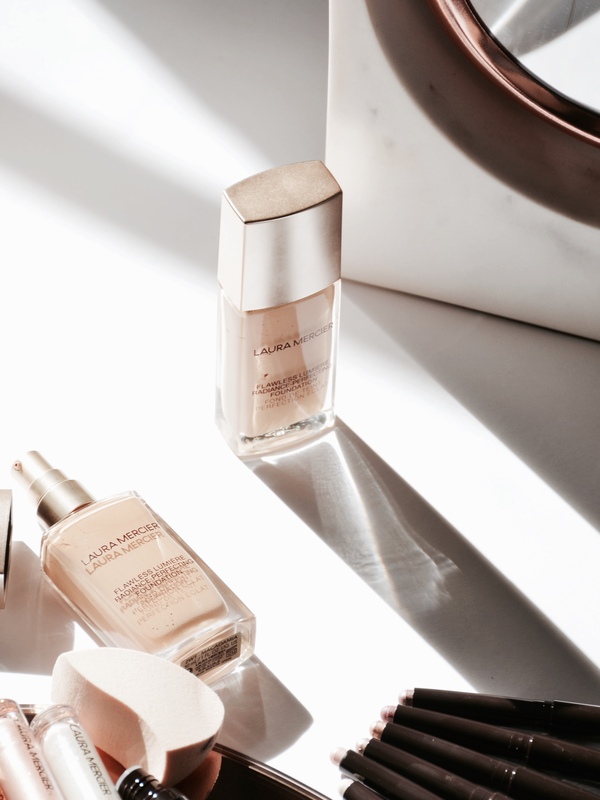 The formula of the Laura Mercier Flawless Lumere Radiance Perfecting Foundation feels very light on the skin. It almost feels like you’re not wearing anything on your face but the coverage is there. I wouldn’t say that this is a full coverage foundation. It is more of a medium but buildable coverage foundation. The finish that I get with the Flawless Lumere Foundation is natural with a subtle glow. This is one of those foundations that looks better as the day goes by, so it wears really well. 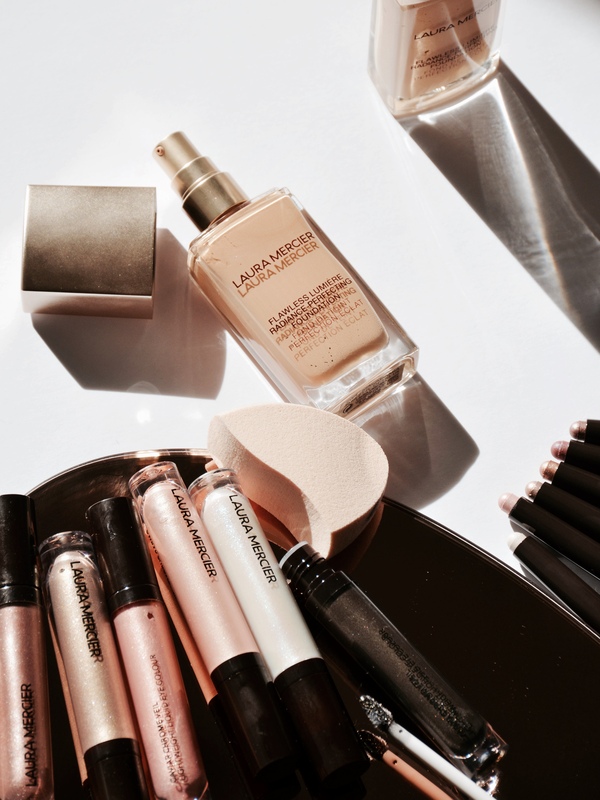 I love to wear the Laura Mercier Flawless Lumere Radiance Perfecting Foundation both for special occasions and for every day use (I sheer it out for a more sheer or light coverage by adding a drop of oil). Highly recommend it for anyone looking for a good coverage foundation that is hydrating but not overly dewy or glowy on the skin. If you are oily, I would definitely use powder to set it. As for my normal skin, I can wear it with no powder or with powder for when I like a more matte look. As for the Chrome Caviar Eye Collection, I’m all about it. The new liquid eyeshadows give a beautiful shimmery glow on the eyes which mimics a glossy eye look but without the creasy mess. Nothing but love for them!